Delos, although is one of the smallest Aegean islands (6.85 sq.km), was in ancient times the most famous and the most sacred of all the islands because, according to legend, was the birthplace of Apollo, god of daylight and Artemis, goddess of night light - light for the Greeks were always very precious. Zeus then created a circle of islands around Delos to pay tribute to his children. Delos is located in the heart of the Cyclades, between Mykonos, Tinos and Syros and is a narrow piece of land with bare soil. On this island, in mythology, Apollo, came into the world, when here resorted Leto, chased by the jealous Ira, to give birth to Apollo and Artemis. Delos was inhabited since 2,500 BC by Kares, Mycenaeans, and Ionians. The Persian invaders respected the sanctity of the island. In the 3rd century Delos passed under the influence of the Macedonians. During the Roman period, Delos was not only a religious center but a bustling cosmopolitan island, with a booming economy. Delos will climb back from obscurity centuries until the 19th century, when excavations began in 1873 by the French Archaeological School, which continues until today and reveal a vast archaeological site, a real paradise for anyone who wants to study the religious and civic life of the ancient Greeks and Romans. Delos survive today findings from the largest and most impressive organized settlements of Greco-Roman antiquity. Visitors can do a quick passage of the various temples on the island. The small island is dry and rocky containing the largest, and most renowned, archeological record in the Cycladic Islands chain. Once heavily populated, these days it is preserved as an archeological environment with no people, hotels or tourist facilities of any kind. Visitors may enter the sacred island only during the day. 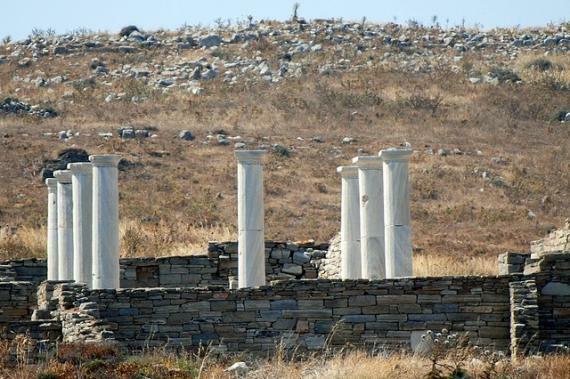 Delos is under the protection of the Ministry of Culture and the stay on the island is prohibited after sunset. Here are the remains of buildings and monuments from all periods of development of Delos, which although not in perfect condition the restoration of these is sufficient to unravel all the development phases of the Sacred home of Apollo. The archaeological site in the northern part of the island includes lodges, the Synagogue and temples. In particular you can see the Artemision temple of goddess Artemis, the Ieropoieio in limestone temple (is the oldest and smallest temple of Apollo), the Temple of the Athenians, the Temple of Leto, the Avenue of the Lions, the Ancient Theatre (3rd century BC) and the major houses of Dionysus and Cleopatra. A lot of history, huh? By boat: There are trips to Delos every day (except Monday because the archaeological site is closed). Of course if the weather permits (it should be understood here that the winter or with strong winds in the summer, things are very difficult, not only for visitors but also for employees and guards).Departure from the old port.